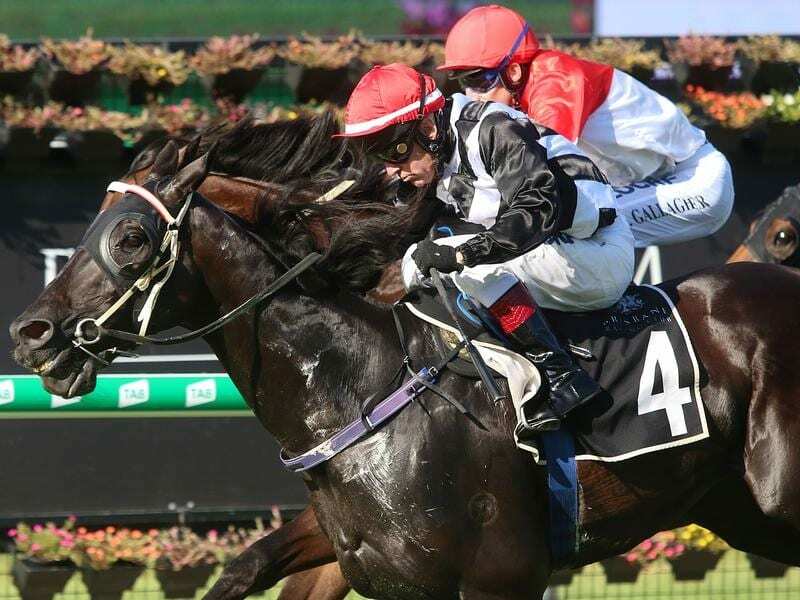 Richie Stephenson will set Emphasis for the Toowoomba Cup after the stayer’s Eagle Farm win. Veteran trainer Richie Stephenson is thinking seriously about one of his long-held goals after Emphasis won the Menkens Finance Handicap at Eagle Farm. Stephenson has trained winners all over Queensland but as a Toowoomba-based trainer he has always held high hopes of winning the local Cup. “I have had seconds, thirds and fourths in it but I have never won a Toowoomba Cup,” he said. “I can’t think of better horse to do it with than Emphasis who cost me $10,000 from a Darley dispersal sale and has won $360,000 for us,” Stephenson said. Emphasis ($8.50) was near the tail of the field but ran home too strongly to beat Bergerac ($4.80), who was last early, by a long neck. Magic Fox appreciated a big drop in class when he charged home for an impressive win. The gelding had been racing in much better company behind star three-year-olds Zoustyle and Boomsara, winner of last week’s Magic Millions Guineas. Trainer Kelly Schweida believes Magic Fox will get his chance in top company again in the winter. “Magic Fox was an emergency for the Guineas and also the Magic Millions QTIS Open but he didn’t get a start in either,” he said. Schweida raced Magic Fox’s dam Plain Magic who won the Magic Millions Fillies and Mares race in 2010. He bought Magic Fox’s half-brother by Love Conquer All for $50,000 at last week’s Magic Millions sales. Port Macquarie trainer Jenny Graham ended her summer campaign in Brisbane with the win of Art Attack ($41). It was Graham’s fifth winner in Queensland for the summer and she plans to be back for the winter. Graham’s best success in the summer was Victorem’s win in the Listed Lough Neagh Stakes while Awesome Pluck showed he was a horse of the future with two wins.